The Jazz Friday series at HMAC features Steve with Philadelphia bassist Kevin MacConnell performing in the Gallery Bar and Restaurant - KMAC @ HMAC!! - food and drink available - no cover charge! Keyboard artist Paul Bratcher and guitarist Mark Ryan play today! Cliff's Tavern presents live jazz every Sunday for Brunch - Noon to 2:30 p.m. - music in the main floor dinging room - free parking - no cover charge. Steve Rudolph plays tonight in the main floor restaurant at Cliff's Tavern it vocalist Erin Cruise. Join us for the Wednesday Jazz Night at Cliff's Tavern...free parking, food and drink available - no cover charge! Steve Rudolph organizes the music for the Friday Jazz series at HMAC's Kitchen and Gallery Bar. Great food & drink, no cover charge, hip atmosphere. Tonight Steve & vocalist Diane Wilson Bedford perform jazz classics and music from the American Songbook - there's a grand piano on this gig! Steve & Erin perform for today's brunch - special menu - no cover - free parking in the Cedar Cliff Mall lot. Cliff's Tavern - Wednesday Night Jazz programming in the main dining room - Steve Rudolph will be organizing the performers from 6-8:30 pm - free parking in the Cedar Cliff Mall lot, no cover charge - full menu and drinks available. Pianist Steve Rudolph & vocalist Perky Scott perform tonight - come join us! Steve appears this evening with talented vocalist Erin Cruise Food and drink available - grand piano in the club - we perform in the Kitchen and Gallery Bar. No cover charge. Steve performs on George Graham's Homegrown Music broadcast at WVIA in Scranton. with Eddie Severn and his son Gabriel. The Central PA Friends of Jazz will be hosting Jazz Jam Session every 3rd Wednesday at Cliff's Tavern - in the main floor dining room. All aspiring jazz musicians welcome to sit in....we hope you will join in the fun! Free Parking - No cover charge - food and drink available. HMAC's Friday Jazz Series continues - no cover charge - food and drink available - very hip scene - grand piano...come join us! The River City Blues Club hosts a 16 piece big band lead by Steve Rudolph and Bill Perbetsky every 3rd Monday of the month. Cliff's Tavern hosts a Wednesday Night Jazz program - Steve Rudolph organizes the performers from 6-8:30pm - free parking, no cover charge - full menu and drinks available. Music is in the main restaurant (or on the patio weather permitting). Mark Huber Duo - Jazz Fridays - 5:30 - 8:30 p.m.
Lancaster pianist mark Huber plays for the Jazz Friday Happy Hour series at HMAC - Food and drink available - grand piano in the club - performances in the Kitchen and Gallery Bar. Steve performs with Kevin Lowe and Bob Hart for the intimate "Jazz in the Attic" venue at the historic State Theater in State College. We thank Jump Street for inviting CPFJ to host live jazz at the Harrisburg Arts Fest again in 2016. We will have live music and jam sessions for the three day Festival. Come visit our tent and join in the fun! Live bands on the Central PA Friends of Jazz Stage today from 10am - 7pm - near the Walnut St. walking bridge. Free parking in the Market St Garage. We thank Jump Street for inviting CPFJ to host live jazz at the Harrisburg Arts Fest again in 2018. We thank Jump Street for inviting CPFJ to host live jazz at the Harrisburg Arts Fest again in 2018. Come visit our tent and join in the fun! Great Cape May vacation spot features jazz on this evening....hope you can join us - more info to come! This promises to be our most exciting Journey ever! Day excursions to amazing places, gourmet Tuscan food, wine, and world class jazz under the stars every night. Several people who have joined us in years past have called it The best of the best! Register now for JazZenJourney, Italy, July 27 - August 3, 2019. 8 magical days of great music, wine, food and glorious landscapes. Steve plays for the for the Loch Haven Jazz Fest day & night!! Paul Jost and Steve are featured at the annual Taste of Jazz event. details to come. Music on the Mountain - On Friday, November 9th from 7:00 p.m. to 10:00 p.m. join the Friends of Kings Gap in the Cameron/Masland Mansion for a fine evening of jazz featuring the Steve Rudolph Trio. Ticket prices are $40 per person and must be purchased in advance. The proceeds benefit the Friends of Kings Gap in our ongoing efforts to support, protect, and enhance Kings Gap State Park and its programs. The ticket price includes complimentary wine, cheese, and hors d'oeuvres. For more information, please call (717) 776-4604 or send email to juneewm@centurylink.net . This concert is underwritten by a generous contribution from the Shearer Family Fund of the Foundation for Enhancing Communities on behalf of R. Scott Shearer. Tonight Steve performs with saxophonist Andy Middleton who is making a rare appearance - Andy is from New Cumberland and currently teaches saxophone and composition at the Univ. of Vienna, Austria. Food and drink available - no cover - free parking. Great food & drink, no cover charge, hip atmosphere - and there's a grand piano on this gig! . For those of you who missed last night's sold out CD release event at Zanelli's, Steve performs at HMAC this evening with special guests from Siena, Italy - vocalist Romina Capitani and bassist Giacomo Rossi. Zanelli's - 314 Bridge St.
We are sold out - should be a great night....thanks for your support!! Italian jazz artists Romina Capitani (voc) & Giacomo Rossi (bass) join Steve for a CD release party in the back room at Zanelli's in New Cumberland. Romina and Giacomo have been performing at Borgo San Fedele in Tuscany on our Italian JazZenJourneys for the last 5 years. Steve & Romina released "I Thought About You" on the PACT Records label just last fall and this is the first opportunity for an American CD release party. We hope you will join us! Food is available for purchase - Zanelli's is BYOB. The Central PA Friends of Jazz will be hosting Jazz Jam Session every 4th Wednesday at Cliff's Tavern - in the main floor dining room. All aspiring jazz musicians welcome to sit in....we hope you will join in the fun! Cliff's Tavern - 1104 Carlisle Rd. Pianist Steve Rudolph and vocalist Cathy Chemi perform for Sunday Brunch at Cliff's Tavern in the main dining room every Sunday - no cover charge - free parking in the Cedar Cliff Mall lot - special Brunch Menu! ...hope to see you there! Steve Meashey (bass) & Steve Rudolph (piano) perform tonight for the Friday Jazz Series at HMAC in the Kitchen & Gallery Bar. Steve organizes the music for the weekly Jazz Friday series at HMAC - great food and drink available - no cover charge. Cliff's Tavern hosts a Wednesday Night Jazz program - Steve Rudolph will be organizing the performers from 6-8:30pm - free parking in the Cedar Cliff Mall lot, no cover charge - full menu and drinks available. The River City Big Band with Steve Rudolph & Stuart Malina on piano performs for the Harrisburg Symphony Societies "Let's Dance" Gala at the Sheraton Harrisburg/Hershey's Ballroom. Information & tickets at 717-545-5527 Purchase Tickets HERE! JJ Shakur & Jimmy Wood perform this evening at Cliff's Tavern - music is performed in the main floor restaurant - food and drink available - free parking - no cover charge. Steve performs a part of the Penn State Jazz Festival that features Benny Golson, Joshua Davis, Marko Marcinko, Eddie Severn and Philadelphia vocalist Elizabeth Radigonda!! Stuart and Steve discuss the upcoming April 6th Symphony Gala featuring the River City Big Band and Steve performs with bassist JJ Shakur. Philly bassist Kevin MacConnell joins Steve at Cliff's Sunday Jazz Brunch - new menu - free parking - no cover! Steve Rudolph & Joshua Davis - 5:30 - 8:30 p.m.
Steve Rudolph presents live jazz every Friday evening at HMAC in The Kitchen & Gallery Bar. Dining recommended - no cover charge. Kevin Valentine sings with Steve and bassist JJ Shakur at Fennici's in Hershey. Steve organizes the music for the Friday Jazz Series at HMAC's Kitchen and Gallery Bar. Tonight trombonist Jim McFalls (Towson University professor) joins Steve for some spontaneous music making - please come by and hear the music - great food and drink available - no cover charge. JazZenJourney, House Concert Series, presents jazz artists Denis DiBlasio (sax/flute) & Steve Rudolph (piano) at the home of Roger & Diann Levin near Hershey, PA.
Tickets: $40 - Please order tickets by Friday March 8th. Baritone saxophonist, flautist, educator, composer, arranger, Executive Director of The Maynard Ferguson Institute of Jazz and head of Jazz and Composition programs at Rowan University, DiBlasio is an international clinician/performer. His scores have been widely published and he is the author of several instructional books on improvisation. Pianist, composer, and educator, Steve Rudolph is the Executive Director and a Founder of the Central PA Friends of Jazz. He is a Yamaha Keyboard Artist with over 50 years of international performance experience. Steve was the recipient of the Harrisburg Arts Award in 2002 for dedication to the arts and community service. Steve plays with the King St. Big Band in a Tribute to Duke Ellington. Tickets and info here! The annual fund raiser for the Cultural Enrichment Fund - Central PA's "United Way of the Arts" - is held in a surprise location and will feature Steve's Trio as well as many other entertaining performances, live auction, and exceptional food. Call for information - proceeds help fund the Central PA Friends of Jazz, the Harrisburg Symphony, Central PA Youth Ballet and many more deserving organizations. Steve Rudolph WILL NOT BE PERFORMING for Valentine's Day at Allenberry's restaurant! They had a double booking.... Please tell your friends....thanks! Cliff's Tavern hosts live jazz every Wednesday evening - Steve Rudolph organizes the music for the series. This evening's music features bassist Steve Meashey with Steve Rudolph... music is performed in the main floor restaurant. Free parking, no cover charge - dining recommended. Cliff's Tavern resents live jazz every Sunday for Brunch - Noon to 2:30 p.m.
Steve Rudolph & JJ Shakur perform today - music in the main floor dinging room - free parking - no cover charge. Steve and Erin entertain at the refurbished Allenberry Resort - no cover - food and drink available - come join us!! The River City Big Band continues the 3rd Monday night tradition with leaders Bill Perbetsky & Steve Rudolph and the other fourteen suspects. Third Monday Big Band night at River City - Bill Perbetsky and Steve Rudolph lead the 16 piece ensemble in music by Kenton, Thad Jones, Basie, Rob McConnell and others with arrangements and originals by members and friends - tickets $10 at the door - under 21 must be with an adult - free parking - food and drink available. we recommend you get there early for seating...it'll be swingin'!!! Seating for this special evening is limited to 30 guests, and you can use the PayPal button here to secure your tickets, which cost only 40 dollars each! We look forward to seeing you! Tenor saxophonist Rob Middleton returns home for an end of the year performance at Cliff's Underground with drummer Marko Marcinko, bassist Steve Meashey, and pianist Steve Rudolph. Food and drink available - free parking. Join us for the annual Ron Waters Jazz Scholarship Party! All proceeds benefit the Ron Waters Scholarship Fund and help to continue the great tradition of our Central PA All-Star Youth Band that Ron has directed for over 35 years. The Fund also underwrites the annual Ron Waters Scholarship for deserving college students and scholarships to financially challenged students who attend the Central PA Jazz Camp. The evening features performances by the CPFJ Youth Band and a jam session with notable Central PA musicians. A HOLIDAY SUGGESTION - GET SOME EXTRA TICKETS AS STOCKING STUFFERS! If you are not able to attend - please go to our online store - https://squareup.com/store/friends-of-jazz/ - to contribute to the fund - every dollar helps us underwrite the Central PA Friends of Jazz educational programs - the Youth Band (rehearsing and performing all year long), the annual Central PA Jazz Camp, our CPFJ Jam sessions, CPFJ College Scholarships, and Jazz in the Schools programs. Help us keep jazz alive in Central PA - GIVE NOW! 16 piece big band led by Steve Rudolph & Bill Perbetsky performs a tribute to the Holiday Season - charts from Stan Kenton, Shorty Rogers, Oliver Nelson and many more....$10 at the door - please come early - the club fills up an hour before the gig - free parking - food and drink available. Flutist Ali Ryerson visits Central PA to perform with Steve Rudolph for Cliff's Wednesday night jazz series - food and drink availble - free parking. Phil Haynes Trio featuring Steve Rudolph, play Holiday favorites! Tim Warfield, Peter Paulsen, Steve Rudolph and Jeff Stabley perform for the Jazz in the City First Friday series - held in the Strand Studio of the Appell Center - entrance on the Philadelphia St. side of the building - we're o the 2nd floor. This week young pianist/vocalist Daniel Sawyer performs in the Kitchen and Gallery Bar. Market Square Bistro - NOON - 2 p.m.
Steve and Tom Strohman perform for the annual fundraising event - Market Square Bistro - in the basement of the church - luncheon and music - call for information! RIVER CITY BIG BAND HOLIDAY MATINEE WITH SPECIAL GUEST JONATHAN RAGONESE! Big Band Dance - Members & guests only.....if you have friends that are members of West shore C.C. - ask for an invitation!! Landis House - 67 N 4th St.
Jazz Fridays @ HMAC w/Steve Rudolph & Cathy Chemi - 5:30 - 8:30 p.m.
Steve Rudolph hosts Jazz Fridays at HMAC Music from 5:30-8:30, no cover charge - great food and drink available in The Kitchen and Gallery Bar. HMAC hosts Jazz Fridays in their Kitchen and Gallery Bar from 5:30-8:30 pm with Steve Rudolph and friends..No cover charge. Great food and drink, wonderful atmosphere...all ages welcome. Steve performs with saxophonist Rick Hirsch this Friday...HMAC now has a grand piano! Steve accompanies renowned vocalist J.D. Walter this evening in the Attic of the State Theater. We are looking for interested new Board & Committee Members for the Central PA Friends of Jazz - Please call 717-540-1010 or email friends@friendsofjazz.org if you are willing to serve! Please join us for this unique concert event on Saturday, September 29th with renowned jazz vocalist Paul Jost! Steve will accompany Paul with the assistance of bassist Bob Hart. This will be an introduction to next summer's JazZenJourney to Italy - save the dates - July 27th to August 3rd, 2019. Pianist Steve Rudolph appears in the Kitchen & Gallery Bar with saxophonist Ryan Kauffman at HMAC's Friday Jazz Series. . Great food and drink available - no cover charge. Tonight Perky Scott performs with Steve at this monthly jazz venue - Boomerang's Patio - just off I-83' s Limekiln Rd. exit. Steve will be appearing with various guest artists one Wednesday a month - in case of inclement weather we perform in the restaurant - we hope to see you there! Jonathan Michel & L'Ouverture (6:30 - 8pm) a jazz tribute to the music of Haiti! Steve Rudolph & bassist JJ Shakur play the "Jazzin' on the Pride" series aboard the Pride of the Susquehanna. Food and drink avaiable - the $10 admission is for the cruise that begins at 7:30 - if you don't take the cruise you can listen from 5:30-7:30 for free.. This concert is available on livestream at the Penn State School of Music. Penn State trombone professor Mark L. Lusk leads the student trombones and 9 alumni in a concert of big band music.. Featuring guest artists from Penn State's jazz faculty including Marko Marcinko & Steve Rudolph. Reservoir of Jazz Series - Marty Ashby / Steve Rudolph Quartet - 5 - 7 p.m. Relax on the lawn at Highland Park to the sounds of jazz performed by Pittsburgh’s finest musicians. Residents of the tri-state area look forward to late summer each year to witness this showcase of the area’s extraordinary talent of jazz at the ever-popular Reservoir of Jazz series. Steve is happy to be playing with Marty Ashby and their Pittsburgh Quartet! Join us for a fabulous evening of jazz, wine and good food to benefit the Central PA Friends of Jazz. Tickets are $125 each and ONLY 75 will be sold. Don't miss this very special event!. Call CPFJ at 717-540-1010 to reserve your spot. Master bassist Victor Dvoskin and pianist Steve Rudolph perform in the lounge at the famous Tabard Inn, one of D.C.'s finest restaurants. Stay at the 11th century monastery - San Fedele - with day trips, luxury accommodations - live jazz performed nightly by Steve Rudolph, wonderful international jazz musicians & special guests - including Jonathan Ragonese & German violinist Joerg Widmoser - it will be a trip of a lifetime!! GERMAN VIOLINIST JOERG WIDMOSER Hear Joerg HERE! View Steve & Joerg in 1988 HERE! View Romina and Giacomo HERE! Video of Klaus & Steve - view HERE! Steve teaches at Rowan U. 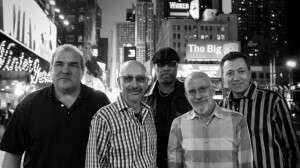 's annual Jazz Camp June 14 - 18 with Denis DiBlasio, Jim McFalls, & more! Steve's 6th appearance in this concert series - this evening in the amphitheater in Heroes Grove near the Lower Paxton Friendship Center...Eddie Severn (trpt) & his son Gabriel Severn (bass) are featured. NEA Jazz Master Benny Golson and over 60 musicians from far and near are featured in this year’s Festival! HARRISBURG, PA – Central PA Friends of Jazz will host the 38th annual Jazz Festival July 5-8 with performances at the Pride of the Susquehanna Riverboat, Appalachian Brewing Company's Abbey Bar, Hershey Library, Mt. Gretna Hideaway, Gretna Playhouse, and Indian Echo Caverns. The Friends of Jazz welcomes NEA Jazz Master saxophonist/composer Benny Golson, whose six-decade career has graced generations of musicians and jazz lovers alike. The Festival promises to be a joyful four days of music and fun celebrating America's original art form. 7:00pm - 12:30am - Abbey Bar at Appalachian Brewing Co., 50 N. Cameron St., Harrisburg PA.
..Come out and celebrate 38 years of GREAT JAZZ with us. The Party is on the 2nd floor of ABC with three bands and a jam session. Music from 7pm to 12:30am - food and drink available. 11:30pm- 12:30am Late Night Jam Session - all aspiring jazz musicians are welcome to sit in! 11am-12:30pm Hershey Library, 701 Cocoa Ave, Hershey PA 17033 FREE EVENT! its influences, and the life of a professional musician. The Festival’s main concert will feature the legendary saxophonist and recording artist Benny Golson and his Quartet. We are thrilled to have these wonderful artists performing in the beautiful Mt. Gretna Playhouse and thank the staff at Gretna Music for their assistance in producing this great event. CPFJ is pleased to present a wide variety of the best musicians from Central PA and beyond at this event. 4:45pm Jonathan Ragonese - CD Release event featuring Tim Warfield Jr.
6:00pm Dutchy-Funk - led by trumpeter Todd Fulginiti - New Orleans Style brass band straight from the heart of Amish Country. Featuring both classics and originals, Dutchyfunk is tastier than a shoofly pie. HMAC hosts Jazz Fridays from 5:30-8:30pm with Steve Rudolph - No cover charge. Great food and drink, wonderful atmosphere...all ages welcome. Internationally renowned flutist Ali Ryerson performs this evening with Steve. River City Blues Club has presented Tuesday evening jazz performances organized by Steve Rudolph for several years - this will be the last event in this series - we appreciate the support River City has given us over the years - come on out and join us for this final performance!! Veteran vocalist Dred "Perky" Scott & Steve perform this evening - come out and enjoy the music! No cover charge, free parking, food and drink available. Bob Hart's Duo visits from State College tonight in the Kitchen and Gallery Bar. Jazz & Cocktails" with Laura Lizcano - 5:30 - 8:30 p.m.
Steve is out of town this week - vocalist Laura Lizcano will perform - come out and listen to this wonderful young voice! free parking, food and drink available, no cover charge - nice listening environment! The River City Blues Club hosts a Tuesday night jazz series - "Jazz and Cocktails" - come join us! Tonight's featured artist with pianist Steve Rudolph is vibraphonist Chuck Redd from Washington DC - we hope you will come out and enjoy the music! Free parking, food and drink available - no cover charge! PSU saxophone professor Dave Stambler plays with Marko Marcinko (dr) Joshua Davis (b) & Steve Rudolph in the Attic at the State Theater - a great listening space! Cathy Chemi & Steve Rudolph - Jazz & Cocktails - 5:30 - 8:30 p.m. The Tuesday evening "Jazz & Cocktails" set continues with vocalist Cathy Chemi and Steve Rudolph! Free Parking - No Cover - Food and Drink available!!! Steve plays every 2nd Wednesday at Boomerang's Grill in New Cumberland with various guest artists - no cover - come join us. The Tuesday evening "Jazz & Cocktails" series continues with bassist JJ Shakur & pianist Steve Rudolph. Free parking, no cover, food and drink available. Steve performs for a fundraising event to support young musicians attending jazz camp. INFO HERE! Guitarist Ken Gehret and Steve Rudolph perform at Victor's Italian Restaurant in York PA - great food and music - see you there! I'm not playing this gig, but I thought you should know about it and be there!! NEA Jazz Master Dave Liebman brings a great Big Band playing Trane/Wayne/& More!! - featuring Jim Ridl, Marko Marcinko, Gunnar Mossblad, Vic Juris - 17 piece band - free workshops at 3:30 for all instruments - Liebman lecture on Trane & Wayne at 4:30 (free) Concert at 7:30pm $15 - available at the door or call the school...Central Dauphin East H.S. Steve performs with Mark Lusk, Dave Stambler, Marko Marcinko and more for the PSU Mardi Gras celebration. Tickets available at the State Theatre Box Office. JJ Shakur, bassist for the Ellington Orch. and Monty Alexander, performs this evening with Steve - no cover charge - food and drink available - free parking. Third Mondays are for the River City Big Band - $10 - 16 great musicians with music from Kenton / Basie / Ellington / and more + arrangements and originals from members and friends - come early for best seating. Classical and Jazz piano event! Dr. Keith Cheng will perform works by Ravel and Rachmaninoff and Steve Rudolph will play improvisational interpretations of each composition in a unique salon concert at Susquehanna Museum's Gallery. Jazz & Cocktails w/ Jim McFalls & Steve Rudolph - 5:30 - 8:30 p.m.
NO MUSIC AT ANDALUSIA - THEY HAVE CLOSED PERMANENTLY!! Vocalist Dred "Perky" Scott is accompanied by saxophonist Jonathan Ragonese, bassist Hassan JJ Shakur, drummer Larry Marshall. and Steve Rudolph (piano) in a jazz celebration of the Songs of Christmas. The West VA Jazz Society's annual Holiday jazz Party features Vince Lewis, Curtis Johnson, Steve Rudolph, Marco Panascia, and Mark Cappellini. The Jazz & Cocktail Jazz series continues with Steve and vocalist Laura Lizcano. Free parking, food and drink available, NO COVER CHARGE - under 21 must be accompanied by an adult. The Central PA Friends of Jazz in a partnership with Messiah College present saxophonist/composer Jonathan Ragonese - Mother Goose and Other Tales, a concert featuring improvising jazz quintet with eight woodwinds, harp, and narrator. Jim Colonna will conduct the afternoon of music featuring the world premiere of Uncle Wiggly & Mr. Pop-Goes. Narrator Michael Greenwald, well known WITF Public Radio/TV personality, takes us on a journey through a wild tale of balloons, foxes, and a weasel who's up to no good. Ending the evening is a set of six tales comprising the Mother Goose Suite. The concert includes a cast of New York's finest young musicians including Grammy-nominated artist Patrick Bartley on alto saxophone, Sunnyside recording artist Glenn Zaleski on piano, bassist Martin Nevin and drummer Mark Whitfield Jr. The Messiah College Jazz Ensemble, directed by Dr. William Stowman, will open the program at 3pm and other Messiah College music students will perform as part of the wind ensemble for the orchestrated works. The event will be held in the magnificent Parmer Hall in the High Center at Messiah College - one of the most spectacular music performance facilities in our region. Please encourage your young friends to attend this concert - children under 12 can attend for free and the student price is $10. Steve Poorman's Ensemble will open the show at 7pm followed by the River City Big Band at 8pm - we hope to see you there! Steve is a guest performer with the Centre Dimensions Big Band from PSU and director Marko Marcinko + special guests! Perky & Steve promote the Dauphin County Jazz & Wine Fest on Good Day PA! Steve performs with Marrko Marcinko/Nate Birkey & Tony Marino at noon; Zeropoint Big Band at 4:30pm, and plays with trumpeter Eddie Severn, saxophonist Larry McKenna, drummer Larry Marshall & bassist Steve Meashey from 7:30-10pm at Stella A's. Trombonist Delfeayo Marsalis brings his stellar group to the Playhouse for our annual Festival Concert. go to www'friendsofjazz.org for details. part of the Summer Arts Series in Lancaster PA - beautiful venue. Steve Rudolph w/ vocalist Anais Reno & bassist Kevin MacConnell - The evening begins with wine and hors-d’oevres at 7:00 , with the concert starting at 7:45. The Riverhouse Concert Series is directed by Odin Rathnam who also performs several times annually in this great space. Attorney Gary Lysacht is the builder and resident of this lovely home with Susuehanna River views just north of the Rockville Bridge. The evening begins with wine and hors-d’oevres at 7:00 , with the concert starting at 7:45. - I'll be joined by my old friend from Philadelphia, bassist Kevin MacConnell, and a rising star vocalist from NYC, Anais Reno. Odin may sit in for a tune or two in what will be a great evening of music and camaraderie. Please join us - TICKETS and MORE INFO HERE! Rick's recording ensemble in concert at the historic State Theater. Perky and Steve perform for the Jazz in the Attic series at the State Theatre - they have been musical collaborators since the late ‘70’s, and although their careers have taken them to various corners of the world, they have continued to perform together regularly. Phil Haynes, Tony Marino and Steve Rudolph back Greg Chaimson in his Senior Recital at Bucknell U. Led by pianist Steve Rudolph & trumpeter Bill Perbetsky, the 16 piece band performs music from Basie, Ellington, Thad Jones, Buddy Rich and more with arrangements and originals from band members and friends. Featured performers are Jim McFalls, Tom Strohman, Ryan Kauffman, Dave Yinger, Eddie Severn, Barrry Long, Oliver Fairley, Michael Druck, Steve Shiffer, Greg Strohman, Mike Yinger, Kevin Lowe, Steve Meashey, and Dale Orris - 4 trumpets, 4 trombones, 5 saxes, piano, bass & drums. Join us for a celebration of Big Band Jazz!! "Jazz in the Sky" concerts feature intimate table seating, drinks, and small plate choices from Aussie and The Fox. Small plates are available for pre-order, designed to feed one person and range from $8-$10. Select Show+PLATE option after picking your seats at the table. If you already have tickets to the show please call 717-871-7600 to add a plate to your table. Jonathan Ragonese (sax) John Swana (EWI) & Steve Rudolph (piano) perform at Cafe 1500 - - call for information! Great food and drink available. Steve leads a trio featuring Ton Strohman & Steve Meashey at the Bluebird Inn's regular First Wednesday jazz series. No cover - food and drink available! No advance ticket purchase is available. Ticket sale (cash only) begins 45 minutes prior to the concert in the lobby. Penn State Jazz Festival guest artists Chris Vadala, saxophone; Jon Faddis, trumpet; Steve Rudolph, piano; Bob Hart, bass; and Marko Marcinko, drums join to present an all-star jazz combo concert. Trumpeter Eddie Severn hosts live jazz at Stella's. J.D. Walter, Tim Warfield & Jim Ridl - 7:30 p.m.
Vocalist extraordinaire J.D. Walter returns to Central PA to perform at the Ware Center's "Jazz in the Sky" series. He will bring the brilliant pianist Jim Ridl and world renowned saxophonist Tim Warfield for an evening of creative improvisation. is featured in the evening's entertainment for this gala event. Call for information - you must have a reservation to attend. Pianist Steve Rudolph performs with bassist Hassan JJ Shakur and drummer Larry Marshall in a FREE CONCERT at the Bosler Library. I'm happy this evening to be watching my friend Bob do his thing at the Ware Center - why don't y'all come along!?!? This performance is now in the Atrium |Join us for this legendary jazz pianist & composer. Widely known for the "Schoolhouse Rock!" songs from the popular TV series of the 70s, 93 year old Dorough is also an acclaimed composer, singer, songwriter, producer and arranger who recently released his 25 recording as a leader, But For Now. Steve Berger/guitar & Pat O'Leary/bass will perform with Bob. Jazz in the Sky features intimate table seating, drinks, and small plate choices from Aussie and The Fox. Small plates are available for pre-order, designed to feed one person and range from $8-$10. Select Show+PLATE option after picking your seats at the table. Already have tickets? Call 717-871-7600 to add a plate to your table. Part of the District 8 Band Festival - the Zeropoint Big Band performs a 1 hour concert. Steve is featured along with Rick Hirsch, Kevin Lowe, Jeff Beck, Dan Yoder, Eddie Severn and more!! Talented vocalist Erin Cruise sings with Steve this evening! Steve will be playing Tuesday evenings at River City Blues Club during the month of January with various guests for their new evenings of "Jazz & Cocktails" - we hope you will join us! Vocalist Diane Wilson Bedford sings with Steve Rudolph, Hassan JJ shakur, and Dave Zygmunt for a pre-new year's event...come join us! Free parking, food and drink available! Steve is a featured guest artist for the Holiday Jazz Stroll in Clarksburg - many artists appearing - 5 clubs a night. Saxophonist Jonathan Ragonese joins Steve, bassist Peter Paulsen, and drummer Larry Marshall for a great evening of improvisattion on Holiday tunes in this "Jazz in the Sky" production - a beautiful place to make music - Bosendorfer Grand piano - wonderful sound - call the Ware Center for info..
Drummer Jeff Stabley hosts jazz every first Friday in the Studio Space at the Strand - Dred "Perky" Scott, Hassan Shakur, and Steve Rudolph join the group on this evening for some Christmas cheer! Steve Rudolph & Bill Perbetscky appear Wednesday at Gullifty's main floor restaurant in Camp Hill - free parking, great menu and drinks! The Pittsburgh Downtown Partnership presents The Biggest Jazz Stage at the Biggest Party on the Biggest Night of the Year! Join us at the EQT Plaza Stage for jazzed up versions of your favorite holiday songs! Don’t miss sets from the Duquesne University Jazz Ensemble featuring vocalist Natalie Tomaro, Dane Vannatter with the MCG Jazz Quintet featuring special guest Steve Rudolph and a featured performance by actress and singer, Gloria Reuben. It all begins at 6:00 pm with Gloria Reuben; the Duquesne University Jazz Ensemble featuring vocalist Natalie Tomaro at 7:00 pm and at 8:00 pm stick around for Dane Vannatter with the MCG Jazz Quintet featuring special guest Steve Rudolph. The MCG Jazz Quintet includes regional favorites Mike Tomaro, Marty Ashby, Dwayne Dolphin and Thomas Wendt, in addition to guest Steve Rudolph. Saxophonist brothers from Harrisburg reunite for an evening of great jazz - Rob Middleton is currently leader of the Birdland Big Band in NYC and brother Andy is performing in Europe and teaching at the University of Vienna, Austria. Joining them are Steve Rudolph, piano; Joshua Davis, bass; and all the way from Portland OR, Alan Jones on drums. Food and drink available, plenty of free parking! Saxophonist Andy Middleton returns home from his gig in Vienna, Austria to perform with Barry Long (trpt) Joshua Davis (bass) Phil Haynes (drums) and Steve Rudolph...this is a FREE CONCERT and part of a series booked by Bucknell U. Join drummer Phil Haynes, saxophonist Jonathan Ragonese, bassist Tony Marino and pianist Steve Rudolph as they provide live sound for the silent film classic - The General - with acting legend Buster Keaton. Join us for an evening of great jazz at Bethel AME Church with three great are vocalists - Sherri Chester-Brown, Diane Wilson-Bedford and Dred "Perky" Scott backed by the Steve Rudolph Trio featuring Hassan Shakur (bass) and Dave Zygmunt (drums). Steve Rudolph, drummer Phil Haynes. and bassist Tony Marino will provide a live soundtrack with original compositions and improvisations for this 1920's thriller - one of the classic horror films from the silent era - please join us!! Two fantastic musicians headline this version of Jazz in the Sky - saxophonist Larry McKenna & trumpeter George Rabbai. Backing them are Steve Rudolph (piano) Kevin MacConnell (bass) & Larry Marshall (drums) Tickets HERE! The Friends of Fort Hunter will hold their annual gala and fundraiser, Jazz & More, “Under the Hunter’s Moon” , on Saturday, October 1, 2016 at the Centennial Barn on the Fort Hunter Park grounds. Ticket Price per person $125. SOLD OUT - THANKS FOR YOUR SUPPORT!! Cost of the ticket includes, Music by Steve Rudolph Trio featuring Kelly Delavaris, Hassan JJ Shakur & Dave Zygmunt. A Signature cocktail, Hor d’oeuvres & dinner catered by Stock’s Catering. Wine & beer will be poured throughout the evening. All proceeds from the gala support the efforts to enhance the park and provide educational programs. Eastman School of Music. Visting artists include Steve Rudolph, Dr. Joshua Davis, Paul and Jim Leskowicz. Faculty Artists include Kim Cook, Daryl Durran, Dr. Mark Ferraguto, Dr. Langston Fitzgerald III, Marko Marcinko, and Dr. David Stambler, also with alumni artists Adam Arango, Ben Coulter, Katelynn Griess-Bidell, Brian ...Powell, and Ryan Wells. This year's event, as in the past, will include masterclasses, open rehearsals, panel discussions and two spectacular concert are entitled "Cuba 2016!!" and "Pay Back." The "Cuba 2016!!" concert on Sunday night at 7:30 in Esber Recital Hall will feature music performed by Professor Lusk, Dr. Davison, Professor Marcinko and Stambler along with the guests Steve Rudolph, Dr. Joshua Davis along with members of The Penn State Slide Advantage, Penn State's premiere trombone jazz ensemble. Larry Marshall, Steve Meashey & Steve Rudolph join Amy on the Bistro Stage for this great arts fest! As you know the third Monday of the month is usually reserved for the River City Big Band but this month we're hosing a special event that includes eight members of the beloved River City Big Band. Our tenor saxophonist Rick Hirsch recently ran a successful Kckstarter program online to raise funds for a recording project that will highlight his skills as an arranger/composer (thanks to you who contributed). The recording will take place on the 20th and 21st of July at Red Rock Recording in the Poconos and feature Tim Powell; Kate Anderson; Greg Johnson; Pete BarenBregge; Oliver Fairley; Eddie Severn; Dale Orris; Barry Long; Jim McFalls; Dan Weiner; Wesley Thompson; Steve Rudolph; Jeff Beck; Kevin Lowe; James Witherite; Tim Breon and more - 20 musicians. In order to get the band to sound like a well worn road band, we will be rehearsing all day Monday, play the gig at River City tonight and then have a day off before recording on Wednesday. Please come out and support this project - the music is guaranteed to inspire and brighten your day!! See you there! Registration forms online at the PA Wine Society's website - Your early registration increases our ability to offer you a seat. Seats are reserved with reservation form and check payable to PWS received in thePWS PO Box 61723, Harrisburg, PA 17106–1723 no later than THREE (3) DAYS PRIOR to any event. Please plan ahead so that you may join us! Diane Wilson Bedford sings with Jonathan Ragonese, Steve Rudolph, Hassan JJ Shakur and Larry Marshall for a great night of jazz at River City!! The River City Big Band will play for the beautiful Desoto Amptheater's Summer Conert Series...Tickets $10 AVAILABLE HERE! The River City Big Band performs music from Buddy Rich, Basie, Ellington, Kenton and more - don't miss this swinging band in this wonderful venue....!! Featured players include Tom Strohman, Rick Hirsch, Oliver Fairley, Ryan Kauffman, Michael Druck, Stevve Rudolph, Chuck Dressler, Greg Strohman, Todd Harrison, Steve Meashey, Eddie Severn & more!! Amazing car show and gala dinner - proceeds go to the Juvenile Diabetes Research Foundation. Open to the pubic - complete information on tickets and more at the web site. Steve Rudolph Quintet featuring Tom Strohman will perform. This gig honors the memory of Miles Davis - 10 musicians playing music from three eras of his music....don't miss it! Lead by guitarist Andy Mowatt - this celebration features, Kirk Reese, Steve Rudolph and many other jazz artistts. Saxophonist Jonathan Raggonese & pianist Steve Rudolph perform an evening of exciting jazz at River City - come join us! Sheraton Hotel, 11810 Sunrise Valley Rd. Dee's musical career is as varied as her four-octave vocal range is thrilling. She is a unique talent who transcends musical borders when she brings her jazz styling, infused with gospel and blues flavoring, to the stage. She has performed and recorded with many 'Legends of Jazz' including Toots Thielemans, Houston Person, Clark Terry, Lionel Hampton, Monty Alexander, John Clayton, and Jeff Hamilton, Hank Jones, Bill Mays, Dennis MacKrel, Bucky Pizzarelli, Ken Peplowski, and Russell Malone – to mention a few. Join us for the "Fourth Monday" Jazz Jam Session @ the River City Blues Club....all aspiring jazz musicians are welcome to sit in - food and drink available - free parking - no cover charge - under 21 must be accompanied by an adult. Join us for this rare jazz event on New Year's Eve - Swing the year away!! Call Gullifty's for details. vocalist Cathy Chemi sings with Hassan JJ Shakur, Dave Zygmunt, Steve Rudolph & more! Marko Marcinko leads a 16 piece big band playing the Shorty Rogers arrangements of the Nutcracker Suite - Eddie Severn & Steve Rudolph are featured...for tickets - CLICK HERE! The Jazz in the Sky series continues with a Jazzy Christmas featuring jazz vocalist Dred "Perky Scott performing with pianist Steve Rudolph and bassist Hassan JJ Shakur. Beautiful venue with wonderful grand piano....$25 ticket includes bar and light food. for tickets and more info! The gifted pianist Farid Barron (formerly with the Lincoln Center Jazz Orchestra and Wynton Marsalis) comes to Harrisburg to play for the Central PA Friends of Jazz Fall Concert Series. He will perform classic jazz piano pieces from Scott Joplin, James P. Johnson, Art Tatum, Fats Waller, Thelonious Monk and many more. Don't miss this great performance on the 9-ft. Steinway at WITF. Tickets available from the Central PA Friends of Jazz. 268 Washington Crossing - Pennington Rd. The Steve Rudolph Jazz Quartet and Hopewell artist Emily Muschinske. Enjoy the sounds of this world-renowned jazz ensemble while watching Emily create canvases based on her interpretation of the music. Steve Rudolph, German Harmonica artist Hendrik Meurkens, drummer Bill Goodwin, and bassist Steve Varner perform for the Hopewell Valley Arts Council. Fund raising event for Clinton County non-profit organizations. River City Big Band features vocalist Kelly Delevaris this evening. Steve Rudolph Quintet..sponsored by the Harrisburg Young Professionals - FREE CONCERT. Main Stage, 22 Delaware Ave.
A JazZenJourney week of nightly concerts with great musicians, amazing cuisine, daily trips to Tuscany sites. Erin Cruise & Steve Rudolph Trio featuring Kevin MacConnell (bass) - HORSHOE CASINO - Sunday Jazz in the Casino. RUSSELL ST., Baltimore MD RIGHT BY M&T BANK STADIUM AND ORIOLE PARK AT CAMDEN YARDS. Please join us for a celebration of the life of Ellen Hughes. The evening will include performances and reminiscences by some of the talented friends and family whose lives continue to be touched by her presence. Following the program, an informal gathering for conversation will be held in the attached Rose Garden, accompanied by light food and drink. Vocalist Alita Moses joins Steve and Kevin MacConnell at the beautiful Jack Binion Restaurant in the Horseshoe Casino in Baltimore - FREE PARKING - reservations recommended - ask for a table near the band!! Byron Stripling’s electrifying and heartfelt tribute to Louis Armstrong has become America’s most popular orchestral Pops program. With his engaging rapport, jazzy vocals and virtuosic trumpet sounds, Byron dazzles audiences wherever he goes. Musical hits from the Big Easy and beyond include, “What A Wonderful World”, “Saint James Infirmary”, “Royal Garden Blues”, “Do You Know What It Means To Miss New Orleans”, “Hello Dolly,” and “Basin Street Blues”. With his signature version of "When The Saints Go Marchin' In" to close the show, Byron celebrates the spirit of New Orleans and always leaves 'em dancing in the aisles! drummer Akira Tana and bassist John Wittalla are featured. Cooking classes, meditations, wine tours and more are offered in this exciting trip to America's finest wine country. Next year's trip is scheduled for April 30-May 4, 2014 - we hope you can join us for a journey to remember! English saxophonist, clarinetist and composer Frank Griffith joins the Steve Rudolph Trio featuring Hassan JJ Shakur and Bill Goodwin in the continuing "Jazz in the Sky" concert series at the Ware Center in Lancaster. Refreshments and lite food are included in ticket price - buy tickets HERE. William Starr Auditorium, 100 South 8th St.
Steve Rudolph and woodwind artist Tom Strohman entertain for the Jazz & Cocktails Tuesday event at River City - food and drink available - free parking - please join us! Live jazz at Bistro 19 every Thursday - Vocalist Kelly Delaveris is featured with bassist Steve Meashey & pianist Steve Rudolph tonight! Refreshments available - spend happy hour with us! Saxophonist Tim Warfield, bassist Steve Meashey, drummer Larry Marshall & pianist Steve Rudolph celebrate the life of Keith Mohler in the first Jazz in the Sky production for 2014/2015. Keith played and booked this series for many years and we honor his legacy on this night. We hope you can attend. 6:00 pm Keith Mohler Memorial Reception No tickets required – Open to all - Come and share as you wish.. For all those to share memories, emotions and drinks with Keith’s family, friends and colleagues. His life and work touched many people (and animals). Our dear brother & CPFJ Board Member, Keith Mohler, who has been both a staple and a champion of live jazz in the music community for many years, has recently had some medical issues which have required him to take some time off from both music and other work. In an effort offset medical bills that are headed his way, and to show the love and support of his musical family & the many listeners who have enjoyed hearing and watching Keith play, we invite everyone to come out and support him with an evening of jazz followed by a wine and cheese reception at the Ware Center in Lancaster, where Keith has been instrumental in bringing an eclectic list of fine performers to enrich the musical flavor of Lancaster. 20 W. King St., next to the Pressroom Restaurant. Jazz pianist and composer Steve Rudolph and saxophonist and composer Jonathan Ragonese will join Mark Hartman and the Orchestra to present a concert of music that draws on the great American traditions of Jazz and film music. The Orchestra will play pieces by these two dynamic performer/composers as well as music from some of your favorite films. Trombonist Jim McFalls, bassist Steve Meashey and drummer Chris Hanning are featured in this exciting evening of live jazz!! A rare quartet gig - come out and enjoy!! Sunday, March 9th, 2014, 3 PM ~ Old Main Chapel, Shippensburg U. Jazz Musician Steve Rudolph has played with just about every important jazz musician of the past 30 years. He has also been at the center of developing a strong jazz culture in Central Pennsylvania, both through his regular performances and his work to develop the Central PA Friends of Jazz. Rudolph will be joined by virtuoso saxophonist and composer Jonathan Ragonese and bassist Bob Hart and drummer Larry Marshall for a concert of inspired jazz improvisation. Premier of my new work for orchestra - The Gift in honor of Maestro Stuart Malina. Pianist Steve Rudolph shows off his composing chops as the HSO gives the world premiere of a new orchestral piece by the local music legend. Cellist Zuill Bailey, praised for his “virtuoso technique, strong, richly expressive tone and bold, individual manner of playing” (Gramophone Magazine), makes his HSO debut performing the Dvorak concerto. Stuart Malina also conducts the sunny and cheerful 4th Symphony of Beethoven. Live jazz at Andalusia every 2nd Monday! Click HERE for complete information - 16 piece band performing the Ellington arrangements of the Nutcracker Suite. Steve hosts live jazz evenings at Gullifty's every Wednesday. Philadelphia vibraphonist Tony Miceli is the featured performer on this evening. Vocalist Amy Banks joins Steve in The Bar at the Hilton for an excursion through the American Songbook....food and drink available. Join us for a free art exhibition / reception and solo musical performance on the Steinway grand by Steve Rudolph, accomplished jazz pianist, composer, arranger and educator. Paintings by Bethany Village resident artists are currently on display at the WITF Public Media Center. Join us in sharing their passion and joy for creating works of art. Bring your lawn chairs and picnic baskets and head out to beautiful Fort Hunter Park for the annual Jazz & Wine fest. This year's event will be held "under the big top" rain or shine. Outside alcohol is not permitted. 16 PIECE SWINGING BIG BAND - DON'T MISS IT!